The bane of many a kitchen's existence; crumbly, dried-out bread is often deemed unsalvageable, an irreversible blight that sits in the bread bin before its inevitable throwing away. In fact, British households bin their stale bread so much it's now our most wasted food, with all manner of loaves, buns, baps, and baguettes getting chucked out to the tune of 240 million slices a year. Before you dispose of that leaden loaf, however, there are plenty of ways stale bread can be repurposed, transformed and given a new lease of life in no time at all. So, rather than contributing to Britain's bread wastage, check out this list of things you can do with stale bread and lengthen your leavened goods' shelf life that little bit further. A staple soup topping and fortifier of salads, the humble crouton rescues stale bread from an early chuck-out and is an absolute breeze to make. Cube up your bread, toss it with some olive oil, herbs (such as oregano, basil and thyme) and a bit of parmesan too. Spread it out on a baking sheet, and toast in the oven on a low temperature until golden brown. Keep them in the fridge when you're not using them. 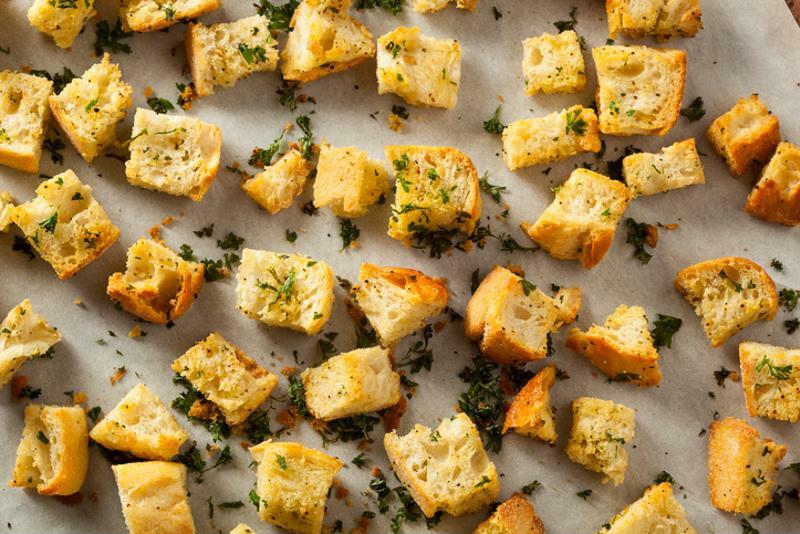 Stale bread can live on as crunchy croutons. A classic for a reason, bread pudding is a filling and delicious pud that's a breeze to make. Whether you have it hot or cold, put your bread to good use and give this iconic British dessert a try. Serve it up with ice-cream or custard while it's warm for a super indulgent sweet treat. A bit of savoir-faire is key to making your bread go further, so why not bolster your breakfasts with a delicious French favourite? Beat egg, a teaspoon of vanilla extract, and half a teaspoon of cinnamon together, then stir in a ¼ cup of milk. Dip in your bread so both sides are covered evenly, then fry on both sides in a lightly greased skillet. Serve up with fresh fruit of your choice and munch away! 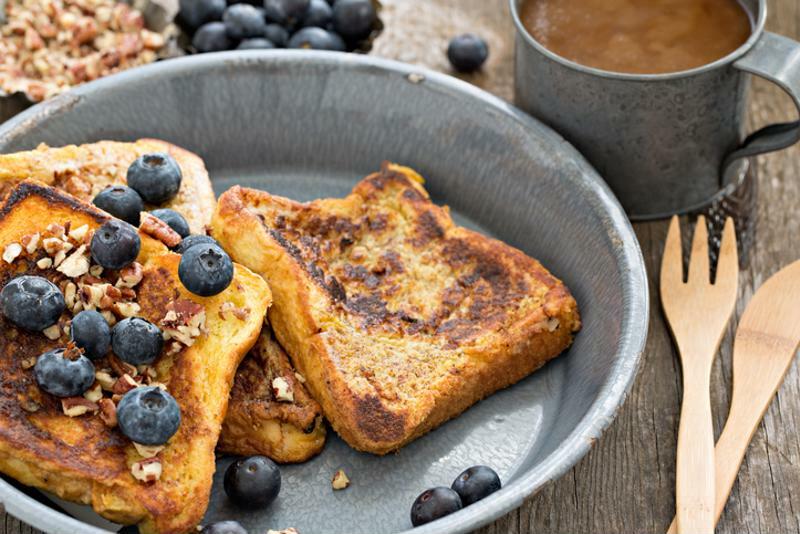 Add a few ingredients to transform your bread into French toast. A cupboard essential that can be used in all manner of dishes, turn your stale bread into a topping for pasta, a coating for fish and chicken, and create robust stuffing to go with your roasts. 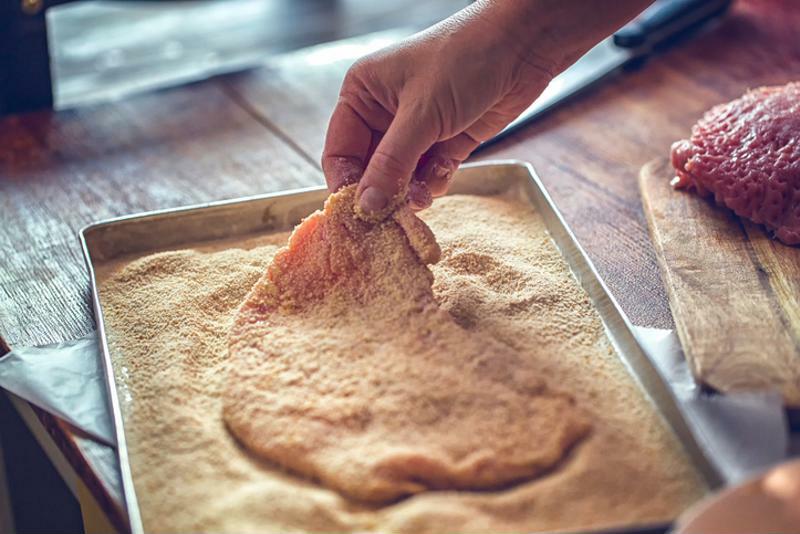 Simply dry out your slices of bread on a baking sheet at the oven's lowest temperature, whizz them up in a food processor, and then dry the crumbs out in the oven for another hour. They'll keep in the fridge for up to four weeks in a regular airtight container. Break down your bread into delicious breadcrumbs. Put down that packet of just-add-water bread sauce, and get making your own with stale leftovers. An old-school accompaniment to the Sunday roast, the DIY approach is well worth trying, and with plenty of rich double cream, it turns your stale crusts into a luxurious sauce with ease. Why not give this recipe here a go? If you don't fancy making anything with your stale bread, there's still reason to hold onto it. Providing it's not too hard, you can reverse its staleness using a simple, tried-and-true method. Pre-heat your oven to 165°C, place the stale bread in a paper bag, fold the opening so it's closed, and dampen it lightly but evenly. Place in the oven until the bread is soft and warmed through. There you have it, bread that's as good as new. A hearty, rustic Italian soup that's built on a foundation of bread, Ribollita, which literally means re-boiled, is a great stew-like meal that's easily made from stuff you'll probably already have in your cupboards. Quick and easy, a big pot of this will have more than a couple of meals sorted for the week, so be sure to give it a try if you're looking for something economical without sacrificing on flavour. This Jamie Oliver recipe is well worth a go. For a breakfast boost that's sure to fuel you through the day, give the American favourite strata a go. Similar to a quiche or frittata, it's creamy and delicious, fortified with eggs and spinach for an instant wake-up call. Give this recipe a try, there's enough for seconds the next morning, and it easily reheats in a microwave. Another no-frills dish that goes down a treat in the morning, cut up your stale sourdough or crusty ciabatta into crouton-sized chunks, and fry them up with bacon, chorizo, garlic, cumin and smoked paprika, and you have migas, a simple, provincial Spanish dish that'll keep you full well into the day. Top with parsley and scoff it all before the morning commute. Ok, so it's a bit of a shortcut as this isn't a proper soufflé per se, but what this lacks in finesse, it makes up for with homely, robust flavours. Plus, you don't have to worry about it rising or collapsing either, and no one has time for that anyway. Bulk up your stuffing of choice with chunks of stale bread next time you're making a roast for the family. The method is largely similar to the way to make croutons above, but you're free to add whatever accompaniments you want, really. Don't ask us how, but a piece of stale bread in your fridge's crisper drawer helps to absorb moisture and keep your vegetables fresh. Just be sure to replace it every day or two for maximum effectiveness. Dog owners rejoice! Your stale bread can be transformed into grub for your best friend, too! Mix a ½ cup of stale breadcrumbs with 2 cups of whole wheat flour, 2/3 cup of water, and 6tbsp of oil. Roll it out flat, cut into shapes and place on a parchment-lined baking tray. Bake in the oven at 177°C and you'll have instant doggy treats in 35 to 40 minutes. What's French onion soup without the cheese-topped, crusty bread sat on its golden surface? A waste of using up your leftover bread, we say. Top your stale bread with plenty of gruyere cheese, place on top of the soup and grill away until the cheese bubbles away. 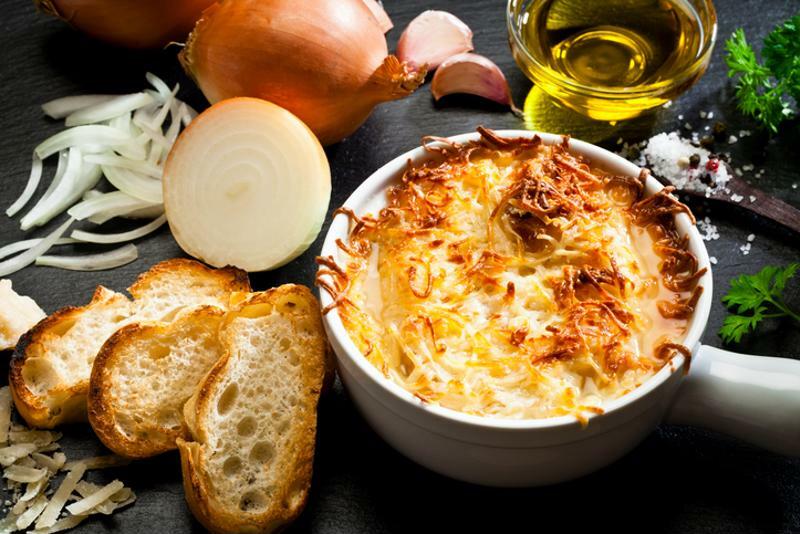 Stale bread could even help enhance French onion soup's flavour. Another weird one, but breadcrumbs can help to nourish your plants by adding plenty of moisture and nutrients to the surrounding soil. All you have to do is make your breadcrumbs the same way mentioned earlier and add to the soil. Don't forget, these can all be stored using the FoodSaver vacuum sealing system, so you can save money and reduce food waste. For more information about our innovative vacuum sealers, visit our homepage.